The state requires Arizona Cleaner Burning Gasoline (ACBG) year round in Maricopa County and parts of Yavapai and Pinal counties, and from May 1-September 30 in the western half of Pinal County (Phoenix metro area). From November 1-March 31, ACBG specifications require CARB Phase 2 RFG and either CARB Phase 2 RFG or Federal RFG for the rest of the year. A minimum fuel oxygenate requirement is in effect from November 1-March 31. Other rules for ACBG include a 7.0 psi RVP from June 1-September 30 at the retail level, and a 9.0 psi RVP from October 1-May 31 (10 psi RVP is permitted only during the month of April). The Tucson metro region has a minimum fuel oxygenate requirement from October 1-March 31. 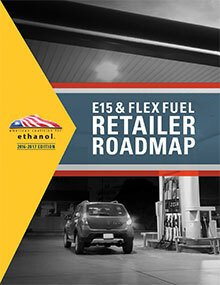 While Arizona has no specific ban on E15, other regulations prevent the sale of E15 at this time. Arizona state agencies, boards, and commissions must purchase hybrid electric vehicles (HEVs), alternative fuel vehicles (AFVs), or vehicles that meet set greenhouse gas emissions standards; or use alternative fuels. At least 75% of light-duty state fleet vehicles operating in counties with a population of more than 250,000 people must be capable of operating on alternative fuels. If the AFVs operate in counties with populations of more than 1.2 million people, those vehicles must meet U.S. Environmental Protection Agency emissions standards for Low Emission Vehicles. Alternatively, the state fleet may meet AFV acquisition requirements through biodiesel or alternative fuel use or apply for waivers. For the purpose of these requirements, alternative fuels include propane, natural gas, electricity, hydrogen, qualified diesel fuel substitutes, E85, and a blend of hydrogen with propane or natural gas. (Reference Arizona Revised Statutes 41-803).